Fresh new website for Scottish guest house! 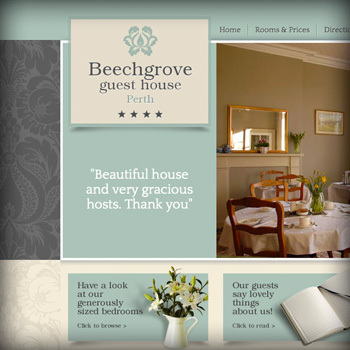 Our latest fresh new website launch was for one of our newest clients, Beechgrove Guest House. The guest house is an attractive Victorian former vicarage located only a five minute walk from Perth city centre in Scotland. CODA were asked to give the guest house a fresh new look with a modern sophisticated colour palette, new logo and design, whilst keeping to its traditional roots. We’ve used some nice animation to showcase the rooms and grounds in a neat engaging slideshow, which added interest and movement to the homepage. We also highlighted, in the slideshow area, great comments from past guests – of which they had many! The inner pages follow a similar but simpler layout allowing for more informative pages. We’re really happy with the finished site and Annie and David from Beechgrove commented ‘The website is brilliant. Thank you very very much for all your hard work!’. Visit the site to see how the finished project looks: www.beechgroveperth.co.uk.